YEE HAA!! - Recreational Vehicle Rentals! 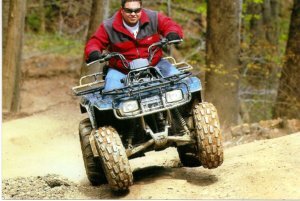 HAVE THE TIME OF YOUR LIFE ZIPPIN' THROUGH THE SMOKIES IN RECREATIONAL VEHICLE RENTALS! Get ready for a "rip-roarin good time" with some of the best "rides" in the Smokies? Yep! This is for real! It's a boat...that travels on LAND! It's one of the most unusual recreational vehicle rentals in the Smokies! You'll be the "talk of the town" as you cruise by on this cool boat! The Smokies also offers kayaking, and jet boating! If you're ready for a boat ride, on land, or on sea...the Smoky Mountains is the place to come! These exciting "fun-time" vehicles are ready when you are! Take off into the Smokies on the "ride" of your choice and have the time of your life! There are lots of ways to view the mountains! However, you really haven't seen the Smokies until you've had a "birds-eye view from a helicopter! Scenic Helicopter Tours in Sevierville show you the Great Smoky Mountains as you've never seen before!There are both long, and short tours. This family-owned adventure has been in operation since 1972. Bring your family for a breath-taking look at the Smokies in a comfortable helicopter with Scenic Helicopter Tours! Feel "as free as a bird" while riding those mountainous roads filled with curves, and fresh, clean air! Riding a motorcycle is a great way to see the beauty of the Smokies! If you've driven a car, just park it in front of one of the many motorcycle rentals places, and get ready to enjoy a recreational vehicle rental like no other! Lots of folk are riding motorcycles through the mountains! It's an adventure you don't want to pass up! Get some "pump action" going with a Smoky Mountian bike ride! Bicycle Rentals Of Cades Cove in the Great Smoky Mountains National Park has bikes for all ages and abilities. The Cades Cove area offers a scenic biking adventure you'll never forget! It's good exercise, and WOW!! !What a view! The Mountains, the wildlife, the flowers,etc..complete the perfect biking experience. You'll love renting a bike, and cruising through the Smokies for an "awesome ride" in Cades Cove. What a way to go!!! And with so much camping in the area, you can find RV's most everywhere! 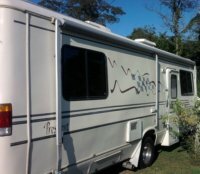 And yes, there are campgrounds who have RV's for rent! It's an excellent alternative to renting a hotel, or cabin! The Smokies, and surrounding areas have RV Parks, and RV Resorts all over!